Beautiful 16th floor condo with both bedroom and living room views of the Gulf! The condo pictured is our 16th floor incredible gulf and city view from our living room and every room in the condo.The balcony has walkout from both the bedroom and the living room. 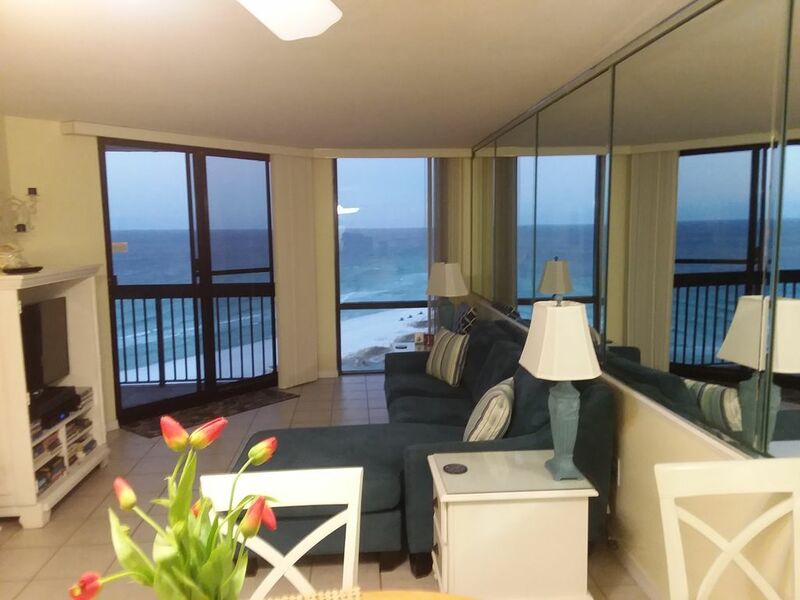 This is the more spacious 1 bedroom unit, that features a king size bed, floor to ceiling sliding glass doors connecting to the balcony, overlooking the west gulf view for at least 50 miles of beautiful beach AND the city of Destin, Crab Island, and the Destin bridge. This unit is ablaze at night with the beautiful lights of the city and the beauty and sounds of the surf at the same time!. Watch the dolphins frolic in the surf from inside your condo and still enjoy the allure of the city lights at night. The pictures on this website have been taken from the balcony just to give you a small idea of how incredible the views are from this unit! This unit features 2 flat screen tv's and dvd player, in both the bedroom and the living room, walk-out floor to ceiling glass balcony from the living room as well as the bedroom, a queen size sleeper sofa, 1 and 1/2 baths, with full size shower/tub.The kitchen features granite counter tops, and a fully equipped kitchen. The window view from the kitchen is the eastern view of the beautiful city of Destin, the Choctawhatchee Bay, and the Mid-Bay bridge. Watch the harbor fireworks from your living room, balcony, or bedroom, when available, unsurpassed views of the breath-taking Gulf of Mexico and fantastic sunsets from our 16th floor condo. SunDestin provides all of the creature comforts one would expect while vacationing in one of Florida's finest hotels. Onsite water sport & Craft rentals, and much more. If you want a great meal or a cold drink both our lobby bar & grill and seasonal Tiki Hut offer a variety to please every palette. Location, affordability and many amenities make Sundestin International Resort one of Destin's top resorts. Payments May Be Made In Check, Cash, Visa, and Mastercard. PLEASE EMAIL US FOR A CURRENT QUOTE OR FOR ADDITIONAL QUESTIONS. Keywords: Beautiful 1 bed 1 1/2 bath. Centally located. Ammenities galore. Onsite bar/restaurant/general store/arcade/theatre room/fitness center/massage spa/jacuzzi/steam/sauna/kids programs/shuffle board/beach rentals/Onsite parasailing, water trampaline, banana boats, kayaks, surf & boogie board rentals. Floor to ceiling windows and balcony doors. We purchased this unit #1617 in April of 2012. We have owned and maintained rental properties in Destin since 2008, but have never managed a rental in a large self-contained resort complex. The idea of having everything within a phone call or short walk away was really appealing to us, especially being able to call in a meal order or a pizza and having it just an elevator ride away! The general store is located in the lobby and is so handy for the forgotten essentials. Although we reside in Minnesota, our trips to Destin are frequent as our children and our grandchild are FL. natives and live nearby. We find that all the great ammenities at Sundestin make it especially lucrative for the kids to come visit. . You can literally park your car in the complex lot and not use it again until it is time to pack it up and go home. This complex appeals to every kind of traveler from large vacationing families to overnight guests that might just want a steam, sauna, swim, or massage, to break up a long tedious road trip. So long story short, we fell in love with the complex and it's many ammenities first, and after viewing many sales units, walked in our unit and knew instantly it was the place we would most want to be for an ideal vacation. We selected Sundestin as our rental property because the immediate area has so much to offer. The complex is a self contained resort and meca of fun, sports, and activities. Spectacular gulf views, beautiful sunsets, many water activities, golf, shopping, beach hikes, shell hunting, and great restaurants. Our Sundestin complex is well maintained and offers a 24 hour desk and security team. The minute we walked into this unit we fell in love with it, and knew no other unit would surpass the beauty and give us that 'you are REALLY on vacation now' feeling that hit us instantly. This unit's WOW factor was unlike any unit we had viewed previously and since. The furnishings, color schemes, and arrangements give you a feeling of beach, fun, casual or elegant. It fits every kind of travel need. After viewing the other units in Sundestin, we felt that no other unit offered the view and spaciousness that our 1 bedroom/ 1 1/2 bath unit did. This sixteenth floor unit is high enough to observe all the activity on the beach and also has incredible views of the city at the same time. Even the kitchen window offers beautiful views of the northeastern side of Destin, which include the Bay and the Mid-Destin causeway bridge. If you are a restless sleeper, you will find the lull of the tide hitting the shore at night the perfect cure for a peaceful sleep. The bed is comfy, the view is spectacular,and the condo is lovely! 2 bathrooms with a shared bathtub/shower room in the center separated by locking doors. large variety of beach rental toys & services available at chair set-up hut on the property site. Both indoor & outdoor pools have deck area with deck chairs & tables. This unit is designed with larger entry way & doorways for wheel chairs. There is a store, sauna, steam room, spa, exercise facility, children's splash pad, 2 pools, 2 hot tubs, and massage therapy on site as well as a nice restaurant and bar. We also offer a 24/7 front desk & security team that can address. questions & concerns at all times. An enjoyable month away from Minnesota "cold"
We really enjoyed our stay in Unit 1617 at Sun Destin in Destin, Florida. This condo was right on the sandy white beach on the Gulf of Mexico . We enjoyed our daily walk on the beach amidst the sandpipers and gulls. We were on the 16th floor and able to enjoy seeing the beach, the city and the lovely sunsets right from our living room and deck. The unit was well stocked and truly a 'home away from home". See you next year. Everything was perfect. Clean and very nice. Will look forward to returning. Great view comfortable bed very convenient. It was a little dusty and several of the outlets didn't work. Other than that I would stay here again. This beautiful condo was exactly as shown in the photos and the view from the balcony was stunning. The kitchen was very well equipped. We definately plan to schedule another visit.Eva was delightful! Good but could have been cleaner! The location was perfect, and the staff was very friendly and helpful. The room needed to be cleaned better. Everything needed dusting,the sliding doors hadn’t been cleaned,the ceiling fan in the bedroom was very dirty. My husband killed what they called a palmetto roach in the bathroom, the young girl at the desk tried to tell me they were harmless and not like a normal roach! I looked it up and they can bite and carry diseases and lay many eggs, like any roach, so yes you can take them home in your luggage and have a roach problem. I know it’s hard to stay ahead of insects,but they should spray more often if necessary. There’s not many towels or wash cloths,so you better take extra. As far as the cleaning they just need to do some good nitty gritty cleaning around the baseboards and other areas.Not just the middle of the floor! Eva was wonderful to deal with she answered my quickly and friendly. I, sure she has no idea of how the room is clean and regularly. We were on the 16th floor and the view was beautiful. Also we had to wipe down the balcony table before we could use it. Thank you for your review.We are so happy you enjoyed our condo and your stay. I do wish you would have contacted us directly upon arrival with any housekeeping issues, rather than waiting 3 weeks to post publicly. We would have been happy to send our housekeeping department to correct complaints or issues of dissatisfaction. Our complex HOA does employ a professional pesticide company to treat our building and each condo on a regular basis. Unfortunately Palmetto's are indigenous to Florida and have wings. Many of our guests (not necessarily saying you) like to keep the sliding glass doors open to enjoy the gulf breezes and beautiful view. This situation invites anything with wings into our premises. (even a bird or two at times) The only remedy I can suggest is to keep the screen door closed at all times when the sliding glass doors are open. Overall it sounds like you had a nice vacation and going forward we hope you will contact VRBO owners directly and immediately with issues that can be easily corrected to make your stay more enjoyable upon arrival. Beautiful Condo with Wonderful Views! The property is very easy to find, the construction on the main road leaves a little to be desired, traffic wise, but it will be a great improvement when it's finished. The resort is right on the beach, the staff was very friendly (newly bought out from what we overheard). Eva was wonderful to rent through, she called and gave us all our information right over the phone and told us to call if we had any issues. The condo is spacious, the furniture comfortable, the views spectacular! We will definitely be returning next year! Thanks for making our first vacation as a party of 3 so great! It will be remembered always! Sundestin Beach Resort is located at 1040 Highway 98 east, in the center of Destin. The Big Kahuna Water Park is 2 blocks west of us on highway 98 and The Track Amusement Center is 2 blocks east of us on highway 98. Rental rate quotes are not locked in until the damage deposit and signed rental agreement have been submitted.